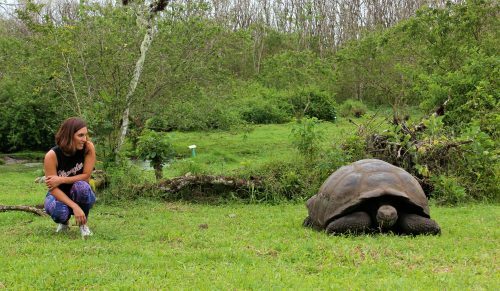 During this travel itinerary you will visit the Charles Darwin Station where you will see different species of Galapagos giant tortoise. You will have the opportunity to swim and snorkel with sea lions, sea turtles, marine iguanas, penguins, rays and different species of tropical fishes. There will be a lot of bird watching; Darwin’s finches, blue-footed boobies, pelicans and frigate birds, among others. And you will also visit volcanic craters. Today you will arrive from your international flight into this South Ecuadorian ciry of Quayaquil to spent one night in a 4* hotel. Today you will fly to the island of Santa Cruz (arrival at Baltra airport) to start your land based expedition. After arrival the tour will take you to highlands of the island with its green vegetation, where they will stop to visit a Ranch. Here you will be able to see Giant Turtles in their natural habitat. You will enjoy lunch at the ranch. Optional activity: After lunch the tour will proceed to leave our “soul print” in the Galapagos Islands and you can take part in a project of conservation on the island. The program consists in planting your own tree in Primicias Ranch, this tree will have your name on it and later on, you will receive a certificate for actively supporting the maintaining of the Galapagos’ ecosystem. After this visit the tour will head to Puerto Ayora to check-in in a selected hotel. Bartolome Island: Discover amazing landscapes, and fascinating geological formations, here you will have great opportunity for snorkeling. North Seymour Island: The main fauna species of this island are Land Iguanas, the Magnificent Frigate bird with their incredible scarlet regular pouch, blue-footed boobies and their particular courtship dance and sea lions surfing across the waves. Santa Fe: This Island has a lot of diversity. The lagoons of the Santa Fe Island provide an excellent place for snorkeling alongside colorful fishes, sea lions, giant tuna and even small sharks that are often sited in these environments. Choose another island to visit today from the above options. After breakfast, we will head to the Charles Darwin Station. The center is the best source of information on habitats and local conservation, as well as other fascinating relevant statistics. The most striking attraction of this station is certainly the Tortoise Breeding Center, where it is possible to view tortoises of varied sizes and shapes. Travelers here can freely walk and get their photos taken with the tortoises. Among other inhabitants at the center, you can see the land and marine Iguanas and different species of birds. After this visit you will be brought to the airport for your fight to Quayaquil (not included in the pricing). A driver will await you to bring you to your 4* star hotel for a one night stay. After breakfast your Discover Galapagos from the island of Santa Cruz will come to an end. Travel Just 4U is happy to connect you with another suggested itinerary from our website. Just let us know where you would like to go.